We offer synchronising panels on rent along with our generators as well as a separate unit. Synchronising panels are mainly designed and used to meet flexible and reliable power system requirements and also where site conditions demand higher load taking capacity for a short duration of time like in the case of starting torque of chillers, power press motors, etc. 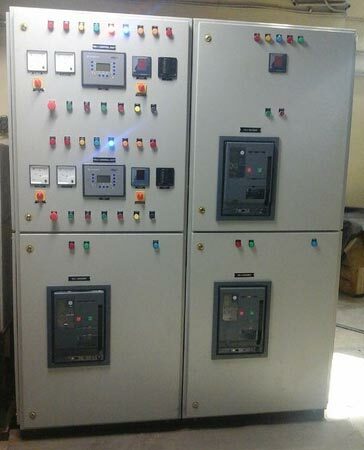 These panels function both manually and with an automatic synchronizing function for two or more generators or breakers. Our high quality range of DG synchronising panels is available for synchronising two or three generators with combined capacity that reaches 10000 A, and are fabricated using premium quality electrical components including copper bus bar, insulations, wires/cable, PVC channels, transformers, meters and switches.